Is My GoFundMe Campaign Tax Deductible? We are inching ever closer to this year’s tax day: Tuesday April 18. The deadline for filing your taxes can bring some stress to even the most relaxed person. How about if you’ve donated to a crowdfunding campaign like GoFundMe? What if you are the recipient of a campaign? Is GoFundMe tax deductible? If you are donating to a GoFundMe Personal campaign, the IRS considers this a personal gift which is generally not tax deductible. In fact, if you give more than $14,000 to any one person, or $28,000 if you are filing jointly, you must pay a gift tax on that monetary donation. If you donate to a GoFundMe Certified Charity campaign, your donation is tax deductible and can be written off. GoFundMe has a program that certifies their listed Charity campaigns as being run by an actual 501(c)(3) non-profit. 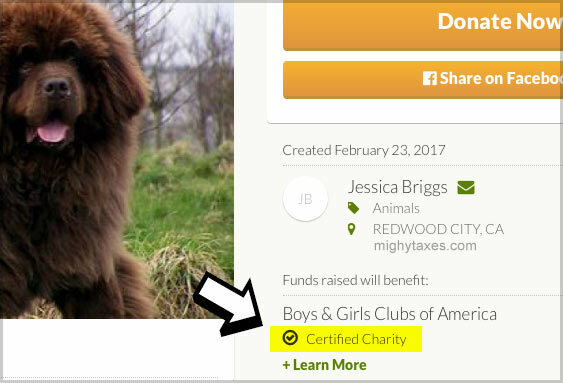 GoFundMe provides a “Certified Charity” badge that will appear below the Campaign Organizers name. In order to ensure you get the appropriate tax write off, be sure to keep a copy of your donation receipt from GoFundMe. If you have created a GoFundMe campaign the tax implications are a little murkier than if you were simply donating to a campaign. Crowdfunding sites like GoFundMe and Kickstarter must report campaigns to the IRS that total $20,000 or more and has at least 200 transactions. The IRS will then send a 1099-K form to the person listed as the Campaign Organizer where they will be held liable for the taxes owed. While crowdfunding has been around for years now, it is still new enough that the IRS has not written code or given guidance on crowdfunding contributions. So, whether you are donating to a GoFundMe campaign, or you are the recipient of the campaign funding, you want to make sure you check with a professional to ensure you are complicit with the current tax law. Gofundme tax deduction? Every tax season the top names in tax prep software like TurboTax (get a coupon) and H&R Block (get a coupon) evolve to accommodate the ever-changing online tax landscape. Just a few years ago, crowdfunding was in its infancy, but now thousands of people give money to sites like GoFundMe and KickStarter, or start their own campaigns. These top brands, as well as every reputable tax professional, should be on top of exactly how to claim donations related to crowdfunding, if required. This is another reason why I don’t recommend free versions of tax software, as they are usually intended to handle only simple taxes, and aren’t sophisticated enough to properly handle most deductions. Helpful guide to GoFundMe and taxes, thanks! I had donated $100 to a “charity” that was on GoFundMe, but I guess they hadn’t gone through the process to be tax deductible. Oh, well. Good tax info!